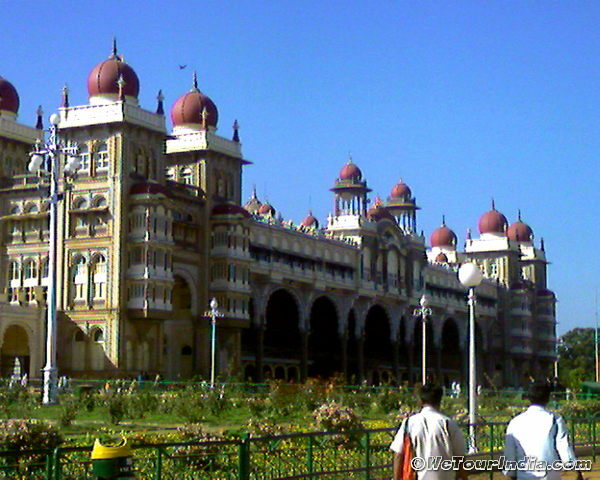 Mysore is a beautiful city in Karnataka. It is second largest city also called as cultural capital of Karnataka. 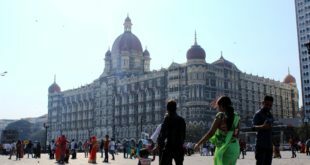 It is mainly known for cultural heritage of Wodeyar dynasty, therefore has become the hottest tourist destination on India. 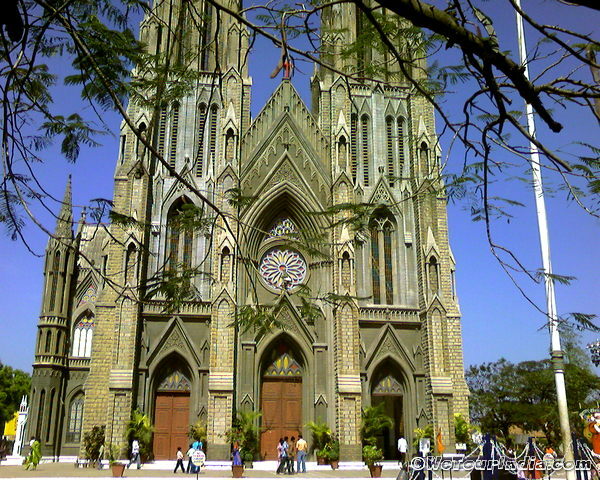 The historical palaces of Wodeyar kings, age-old Chamundihills and St. Philomena church are some of the tourist places in Mysore. 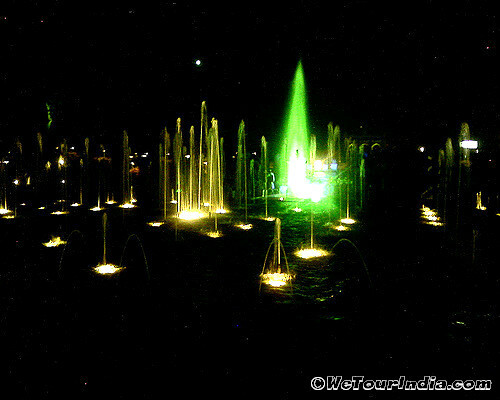 Brindawan garden and its musical fountain show is the real crowd puller on weekends. It is also significant for celebrating Dussehara as the place was once abode of demon Mahishasur who was later killed by Goddess Chmundi. 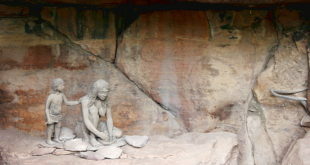 There are other many important tourist places near Mysore describe in the article. 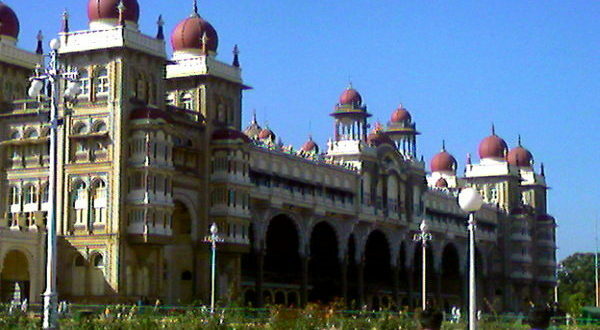 Until 1947, Mysore was the capital of the Kingdom of Mysore and was ruled by the Wodeyar dynasty, except for a 40-year era in the 18th century when Haidar Ali and Tipu Sultan were the rulers of the province. The Wodeyars were patrons of art and culture and contributed significantly to the cultural growth of the city, which has led to Mysore earning the sobriquet Cultural capital of Karnataka. The city remained the capital of the Wodeyars till 1947, with Palace as the center of administration. According to Hindu mythology, the area around Mysore was known as Mahishuru or Mahishapuram. It was ruled by a demon, Mahishasura. The demon was killed by the Goddess Chamundeshwari, whose temple is situated at top of the Chamundi Hills. Mahishuru later became Mahisuru and finally came to be called Maisuru, its present name in the Kannada language. The anglicised form of the name is Mysore. Nearest Railway Station: Mysore Junction; Bangalore City railway station. There are connecting trains running daily on Mysore and Bangalore route. 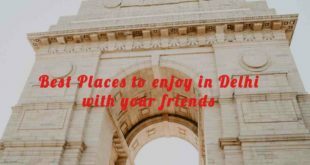 Tourist from Bangalore can go either by KSRTC buse or a tourist bus or by their own vehicle; even the place can be reached by bike as the road from Bangalore is excellent. Dussehara Celebration: Mysore is famous for the festivities that take place during the Dussehara festival when the city receives a large number of tourists. Mysore Mallige: the Mysore style of painting. Mysore Pak : the sweet dish. Mysore silk saree: Silk sarees. Jayalakshmi Vilas, which is now on the University of Mysore premises. Mysore Palace: Intricately carved rosewood doors and ceilings some with inlaid ivory work, marble figurines, collections of caskets, paintings of the members of the royal family and other objects of personal use exhibit such opulence, though age as worn them out a bit with slight discoloration. On Sundays and National Holidays between 7PM-8PM the palace is illuminated by close to 100,000 bulbs – a sight so magnificent that it leaves you gasping for breath. Entry is through the south side. Brindavan Garden: A big and beautiful flower garden near Krishna Raja Sagar Dam full of lighting will be seen crowded in night. At 7 PM the “musical fountain” light and music show starts. St. Philomenas Church: A beautiful Cathedral, reminiscent of medieval architectural style,is one of the largest church in the country. Built in the Gothic style, the Church is an imposing structure with stained glass windows and lofty towers. 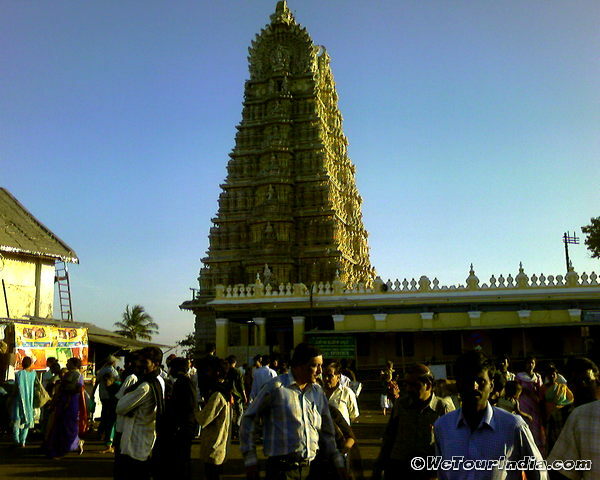 Chamundi Hills: It has a temple of Goddess Chamundeshwari (or Chamundi). The huge Nandi statue on the mountain is also well-known. The Hills are 3300 Feet above sea level and are known for their wild life like leopards, but trekking is safe, and facilities to climb to the top are available. Atop the hill, Goddess Chamundi’s idol is placed in a beautiful temple with marvelous architecture. It is a plastic free zone. Jagmohan Palace and Art Gallery: A former palace that has been converted into a wonderful art gallery featuring famous works by various Indian artists. Mysore Zoo: It is one of the city’s most popular attractions. It was established under royal patronage in 1892, making it one of the oldest zoos in the world, and since then millions of people have enjoyed its wonderful animals and spectacular grounds. The zoo has a very successful breeding program and houses animals from more than 40 different countries and there are many native Indian animals as well, including Royal Bengal tigers, white tigers, elephants, giraffe, fallow deer, Himalayan black bear, Gaur (Indian bison), white peafowl and African rhino. The zoo is also home to many other exotic creatures from around the world like Branary sheep, giraffe, hippos and gorillas. The zoo also encompasses Karanji Lake, which attracts several species of migratory birds during the breeding season including painted storks, pelicans and darters. Botanical Garden: It has 35 species of exotic ornamental plants and 85 species of trees from India and abroad. Srirangapatna – Tippu Sultan’s summer palace. Bandipur National Park: – A tiger reserve around 90 kms away. Tour and travel agent provide one day trip for Mysore, 6 o’clock in morning to 12 in night. Brindavan garden musical fountain show is the last place they cover. Some try to avoid Chamundi hills as it is a steep drive up a hill, but on request of tourist they do cover it also. 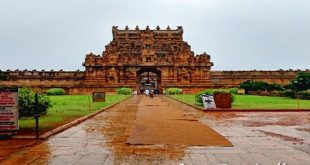 Traveling in tourist bus is good for first timer as they provide a Guide, who will tell some historic facts about age-old monuments at Sringpatnam and Chamundihills. Shoe and camera at Mysore palace is not allowed but photography from outside is allowed. Entry fee is Rs.20 for Indian nationals, Rs.200 for foreigners. Mysore Palace is illuminated by close to 100,000 bulbs on Sundays and National Holidays between 7 PM-8 PM. Entry fees at Chamundeshwari temple is Rs. 20 for regular queue (typically longer). Rs 100 for shorter queue. Helpline no. +91-821-259-0027. is available 24 hrs for any inquire of various service timings at Chamundeshwari temple. Mysore Zoo is opened on all days except Tuesday from 8 am – 5:30 pm. Entry fees at Botanical Garden are Rs.30 for adults, Rs. 10 for children over 5.